Leaving the family house to go and get married is an act to which a strong symbolic significance is given. Once there was the custom of walking to the church followed by a small bridal procession of friends and family but today it's become quite common to use a beautiful car, even for the shortest trips. If one wants to cut costs, you can use your own car or that of a friend and have a family member drive it to the church. Nevertheless the most common solution is that of hiring a car with driver, contacting one of the specialized companies that offer a vast array of models: from extra luxury ones to antiques cars. 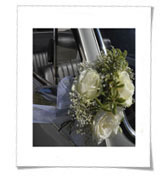 The bride and her father will travel in the properly decorated car on the way to the church, while after the ceremony it will be the groom to take the father's place on the way to the wedding reception.